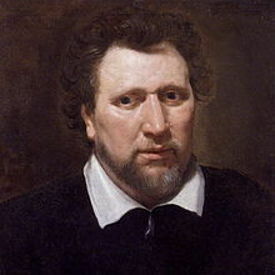 Benjamin (Ben) Jonson was an English playwright, poet, actor, and literary critic, who popularized the comedy of humours. He is best known for the satirical plays Every Man in His Humour (1598), Volpone, or The Fox (c. 1605), The Alchemist (1610) and Bartholomew Fair (1614). There are many legends about Jonson's rivalry with Shakespeare, some of which may be true but none have been proved.